¡CUMBRE! 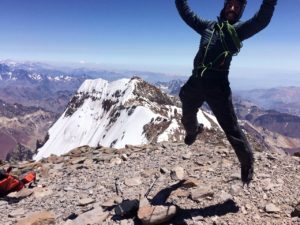 Another successful Rapid Ascent Aconcagua (22,841′ / 6962m) summit! The team was back in C3 (19,700′ / 6000m) early this morning and they are currently making their way back to base camp (13,800′ / 4206m). Aconcagua is famous for many reasons. It is the tallest peak in the Southern and Western Hemisphere, and also the highest peak outside the Himalaya. Its high altitude makes it the ideal training ground for 8,000 meter peaks like Cho Oyu and Everest. Click here to check out our website. Interested in our international expeditions? For more information shoot us an email at info@alpenglowexpeditions.com or call the office 877-873-5376. Way to good Dad!!! Huge congratulations to all. Way to go everyone!!! Such an amazing accomplishment! So proud of you Jeff! !